Coyote Blog » Blog Archive » Angola? 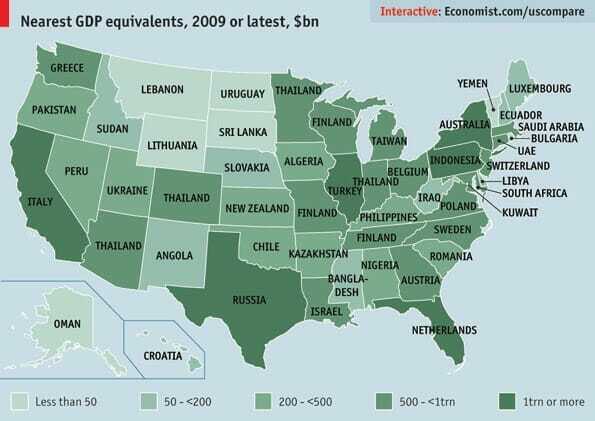 It would be more amusing to map the states to countries whose per-capita debt to GDP ratios are similar. I think there's more than a little symbolism here. I love the pairing of California with Italy. Both have hopelessly corrupt governments and crushing debt loads. And Mississippi really is the Bangladesh of the US. Yeah, but in defense of California, our women have better hair management. It's a small token in the grand scheme of things, but we go with what we have. With respect to Arizona, (if memory serves) only about 20% of the state is private land, which I assume has a big impact on economics. The rest is Indian Reservations, National Forests, National Parks, BLM, military bases and ranges, National Monuments, and State Trust Land. Mississippi's pairing is more amusing than Alabama's? Maybe you could share such levels?